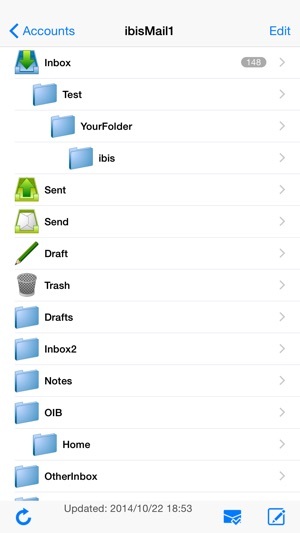 ibisMail supports creation folders and filtering rules. You can view various types of files such as office files and zip files. Additionally, ibisMail can connect to various types of mail servers as it supports most protocols and authentications. This application is compatible with iPhone and iPod touch. Requires iOS 9.0 or later. -You can save attachment files which you received into Dropbox. -You can attach files from Dropbox to a sending mail. -Save attachment files which you received into Dropbox. 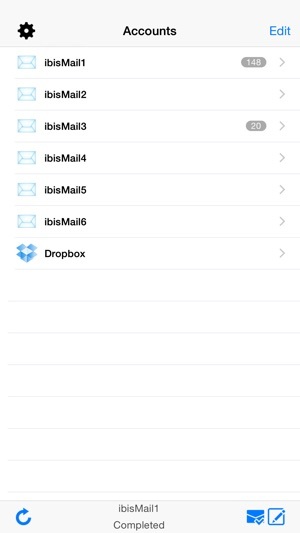 -Attach files from Dropbox to a sending mail. -receive and send messages on itself. 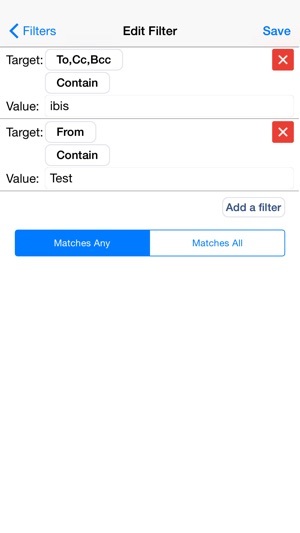 -create folders and rules for message filtering. -The option to keep the communication when the application goes to background. -Search functions in "Body", "From", "To", "Subject" or "All". -open the attached file in other apps. -open the attached files in other apps which the kind of files are not supported in ibisMail. -macro templates for new message, reply message and forward message. -saves 1,000 messages for each account. 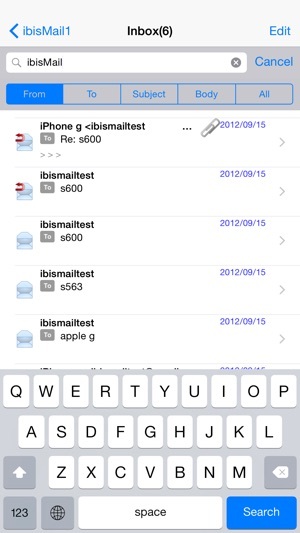 -send and receive messages with POP3, IMAP4, SMTP. -variety of authentications. APOP, POP before SMTP, CRAM-MD5 and Digest-MD5. -turn off/on(choose from samples) receiving and sending sounds. -Send pictures(When you compose a message, you can choose images from photo library or use camera). -Forward attachments such as Image files, Office files, zip, pdf and etc. -high speed decoding attachment files. -sending and receiving messages, you can see progress with the status message. -show name of Contacts on Message List Screen and Message Body Screen. However, this feature is enabled only if the address is 50 characters or less. (Default is off). -If you have any problems such as connection or login errors with above mail services, please give us reports.But, it may not be supported. If you still can't create it. 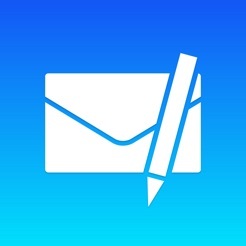 The concept of Apple Mail seems to be simple. However, ibisMail is aiming to be high performance and have more functions. If you think ibisMail have not enough functions, please send us your requests. If you find some bugs, please report to us. We will improve our application and will be very attentive to your requests. Questions and bug reports in reviews is that we can not respond. Please contact to " ibisMail Support team". Thank you for using ibisMail for iPhone! After this update, ibisMail supports iOS 9.0 or later. If you have any problems, please inform us via the "Bug reports and Requires" of "Developer Website" and not via the App Review. The summary of this update is below. - Update with changes of the Dropbox specification. I began searching for an Apple Mail alternative for a simple (and highly requested) reason. My imap server does server side filtering (moves messages to folders based on conditions). Mail on the iPhone does not poll folders under the inbox for new messages (strangely enough Apple Mail on OS-X does, and by default). This is really an important feature to me and the only reason I purchased this app. Needless to say this app does not support this feature either. I sent in a feature request and am hoping the developers are responsive and can implement this. I know there are a huge number of iPhone users who want this as well (just google it, it's all over Apple forums). If this were the only issue I would have given it three stars instead of two but a moment ago I tried to use it to listen to a voicemail I had on my voip line (a simple .wav file attachment) and it doesn't seem to be able to play it. So not only does it not improve on Apple Mail in any way that I care about it is actually less useful. Should the developers implement these features I will definitely revise my rating but as of right now I am regretting this purchase. Totally Useless for either of my gmail accounts, still. Well, now I can't even add accounts for G-Mail... This version seems worse. If I can't add an account, what's the use in syncing. I'd rather have my money back until it's out of beta, but oh well. I'm beyond livid. Obviously, this is buggy software packaged a fully featured app. Was the $.99 worth it to you, Mr. and Mrs. Developer? Was it worth rushing your software out to special sale price it at a buck, and end up with a lousy 2 star average rating? Neither of my two gmail accounts (yes, gmail, not some unheard of dark-side-of-the-net email provider) are able to sync. I've double checked every setting, and this app just says "Updating folders" or something to that effect, then presents me with a useless EMPTY inbox. 3 app I've bought, and this was really the only disappointment. It might be nice of you guys to list the KNOWN BUGS up at the TOP, so that paying customers don't have read every little line of propaganda to find out what's beta about your app. Sheesh, this is worse than the prescription commercials that rush to list 47 side-effects in the last 5 second of their spot. Great UI and Great App!! Well I’m not sure why all the bad reviews??? 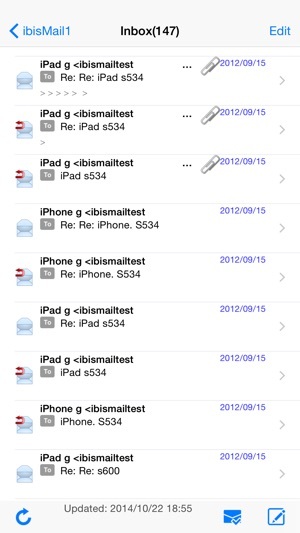 I have 2 pop3 and 2 IMAP mail accounts and all work great! This is what the mail app should be that came with the phone. Most of the bad reviews I think are self inflicted problems and not the app. Setting up mail setting are a pain as it is and this one was no different then the others. It took a couple of tries to get Mobile Me to work but it works fine now. Make sure when you set up the app, you copy your setting from your mail account from your phone and not from your desk top as they are not the same. At least mine are not. As far as the app, I now can save my emails in a folder and make them smart folders as well. If you do a lot of emailing, this is a must have app. Great Job and keep up the good work.